They did it the hard way. But they did it the Buckley way. 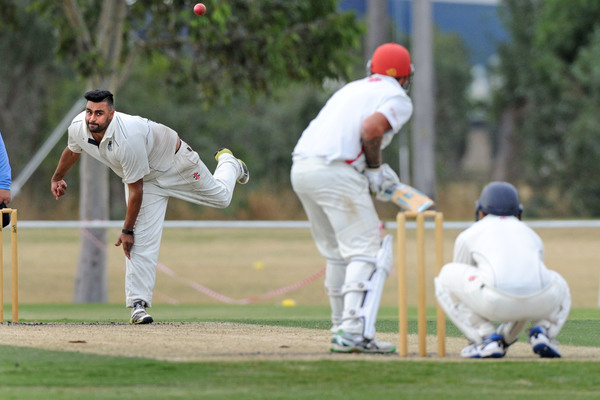 Buckley Ridges knocked off the powerful Springvale South in a Dandenong District Turf 1 grand final for the ages last weekend, 23 and 24 March, in an epic that went down to the very final moments where light was fading and exhaustion was at a high. In a premiership that no one from the little powerhouse out of Park Oval will forget in a hurry, the Bucks endured so many twists and turns of momentum before Ben Watson’s safe hands brought glory and a flurry of supporters streaming onto Carroll Reserve with an almost deafening roar. But that moment, which will be etched into Buckley folklore forever, was brought about by many defining moments, and day one saw the first of these many defining hands. Wild early weather on the first day meant that the 11am start time would need to be pushed back, and after the clouds cleared and the sun finally made its way out, captain David White wasted little time in winning the toss and electing to bat on a surface that from a glance looked a batting paradise. In a tense start to the day, the Bloods struck early, with the ever dangerous champion that is Daniel Watson departing at the hands of lightning quick Matt Wetering (1/40). But stunningly, that would be the very last time Craig Slocombe’s side would enjoy a wicket, they were simply blown away by firstly the discipline of the Bucks, and then finally the aggression of their superstar captain. Tempering his usually flamboyant style, White and club champion Paul Rudd came together and just built the innings, it was nothing fancy, just sensible grand final batting. White slowly worked into his natural game, and beginning to show more signs of aggression, the superstar captain-coach eventually pushed a single to reach an excellent 111-ball half-century, while Rudd remained steady, almost impenetrable in defence. While the Bloods have been serviced superbly by their group of excellent slow bowlers, the Bucks remained firm to get to 1/101 at tea, with White fully set on 55 and ready to launch while Rudd – channelling his inner Cheteshwar Pujara – was beginning to frustrate the Bloods with an incredible 38 off 170 balls. The former South African A batsman, as anticipated, lifted his intensity after the break, launching a fourth six of the innings just shortly after tea, racing to 82 just 15 minutes after the resumption of play, clearly looking to get things moving. Expansive as he is brilliant, White moved into the 90s with some truly glorious stroke play simply wowing the crowd, and fittingly, reached his tremendous century – his sixth in 16 innings in the DDCA – in the same over as Rudd reached arguably the most vital half-century of his stellar career. It began to become a worry for Slocombe’s side as the Bucks just easily manipulated the fields in the latter stages of the days, and a simply stunning final over of the day from White was must watch cricket. Surging past 150, White creamed two sixes off the first two balls as the Bucks reached a formidable 1/238 at stumps, with 10 overs still to bat on day two, while Rudd, batting through the day in an incredible knock of determination and grit, remained on 73. With ball in hand on a warm day two with a strong breeze, Craig Slocombe looked to hold off the Bucks’ surge, but stood little chance to a final flurry of boundaries. Rudd’s epic came to an end for 93 off 73 balls after selflessly looking to find the boundary every ball, not quite clearing Michael Vandort on the fence to give the Bloods a second wicket. It also ended a 261-run partnership, a clear grand final record, in the process. It took two run-outs in a row to spark the interest of the Bloods’ crowd, with Ben Watson falling short of his ground for eight before White – on 178 and eyeing a double hundred – was unluckily run out on the non-strikers end after the bowl ricocheted off the foot of Slocombe. It forced an end to one of the more sublime knocks seen in the DDCA history. 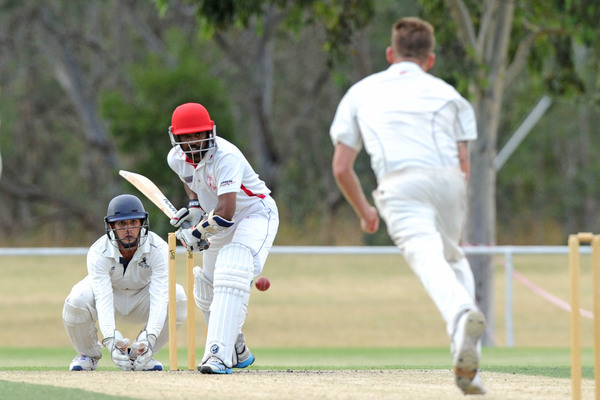 White, who also carved 155 runs in the prelim a week earlier against Hallam Kalora Park, finished his freakish season for the Bucks with 1252 runs at 125.2. Let that sink in. Despite the quick wickets, the Bucks were well served by Troy Aust (28 off 14), who helped his side to 6/326 off the allotted 90 overs with a late cameo. But one of the familiar adages reverberating across the ground was to ‘not discount these Bloods’. It couldn’t have been truer. Starting superbly in their monster chase, it was obvious from the outset that gun opener Nathan King was in an ominous mood. Playing some cracking shots, particularly square and lofted down the ground, King’s brilliant knock was by no means chanceless, but it was breathtaking. The Bloods looked frighteningly comfortable on a pitch offering nothing for the Bucks’ quicks, and at lunch, going at a nice rate, they were 0/63, with King flaying the ball to all parts and showing a willingness to throw his hands at everything, while fellow opener Michael Vandort was rock-solid, and sweating on anything on his pads. But, after the break things got moving even quicker. A monster six that almost took out the sightscreen at the Box Street end rattled King along to 71, and just after the drinks break, brought up a memorable century with a single, much to the delight of the supporters. Playing a supporting role perfectly, Vandort just ticked the score along with some clever cricket shots into the gaps, and eventually crossed a brilliant half-century. Things were looking even more ominous when King lofted arguably the shot of the game – an exquisite lofted cover drive for six – to lift the Bloods to 0/164 closing in on tea. But an unbelievable moment, a second of misfortune for the Bloods, King was run-out in an identical fashion to White for 134, ending his sublime knock by throwing his head back in shock after he was caught short while at the non-strikers end. 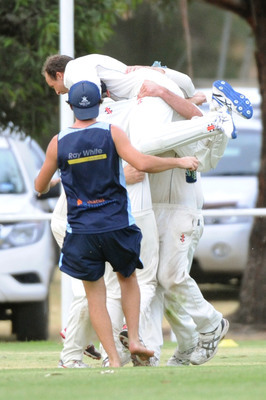 It brought the six-time Wookey Medal winner Steve Spoljaric to the crease, who survived an extremely close LBW shout on the final ball before tea, with the Bloods going into the final break in a commanding position at 1/184, leaving them almost 45 overs to race down 143 runs with nine wickets in hand. Almost immediately after tea, the Bucks finally got some reward, with Jurgen Andersen (3/105) trapping Spoljaric for a duck in another defining moment in the match, and could have very nearly snared Vandort for 71 had it not been for a dropped catch in slip not long after. With something needed to happen for the Bucks to get right back into contention, there was another defining moment, and it came in the form of one of their unheralded stars – left arm spinner Wes Nicholas. Many called on him throughout the day to be brought on after it looked like the Bloods would run away with a seamless victory, and he was sublime. Taking 4/38 late in the day in some of the most critical moments of the match, all of his mountains of experience was evident. 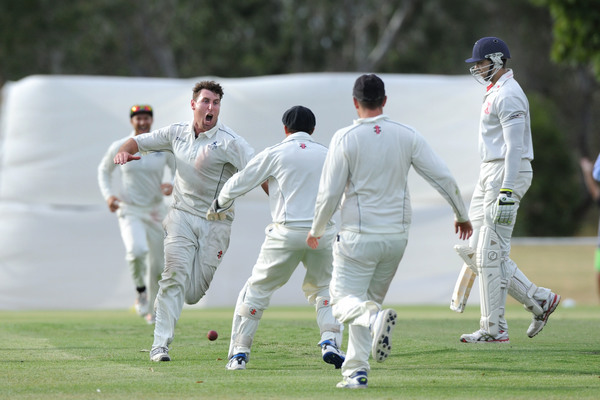 Nicholas held onto a chance off his own bowling to remove Jack Sketcher for just one, and when Matt Goodwright stretched at gully to take a brilliant catch to remove Craig Slocombe for just seven, the Bloods had slumped to 4/221, and it was game on. Vandort continued to look a class above, playing his shots and starting to gel with Malinga Bandara, but one of the more extraordinary pieces of fielding brought about his undoing for a 214-ball 90. 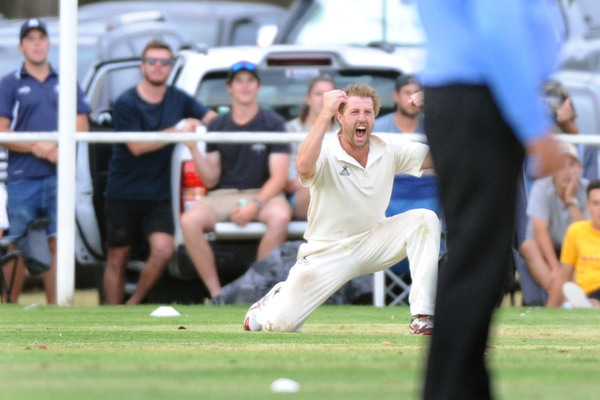 Daniel Watson (1/33) – in what loomed as a vital spell to try and pry out the left hander – stuck out his right hand and plucked an incredible caught-and-bowled off his own bowling, after Vandort creamed one straight, but in the air. The emotion on his face, and the noise of the crowd said it all, the Bucks were pressing hard. Bandara (46) all of a sudden loomed as the man to take the game away, but Andersen – in a final spell that was full of heart – knocked over Matt Wetering with a lethal yorker, bringing the Bloods to 6/272, and needing 55 from 74 balls. While Bandara continued to tick over the scoreboard, Nicholas was in the midst of one of the great spells, bowling with immense control and setting up Tim Ford (10) for his eventual dismissal, trapping him plumb in front to bring the Bloods to 7/289. Looking to get things moving with 27 required off 30 to win, Nicholas forced Jarrod Armitage into a false stroke, with White taking a catch at cover to make the equation simple enough: 27 needed off 29, with two wickets in hand. With tension in the air, and with no foreseeable insight into who would walk away victors, a stunning catch at cover from Matt Goodwright had the Bucks in the box seat, removing keeper Liam Hamilton (9) after he loomed dangerous with a boundary only moments before. Coming out injured, Bloods spinner Jarryd Straker was the last man to the crease, but his services weren’t needed as Nicholas lumbered into the wicket on the first ball of the 89th over, with 12 needed off 12 balls. At first glance, Bandara looked to have cleared the long-on boundary for a glorious six after taking it on, but it just held and there was pin drop, and an eventual catch taken on the boundary by Watson. 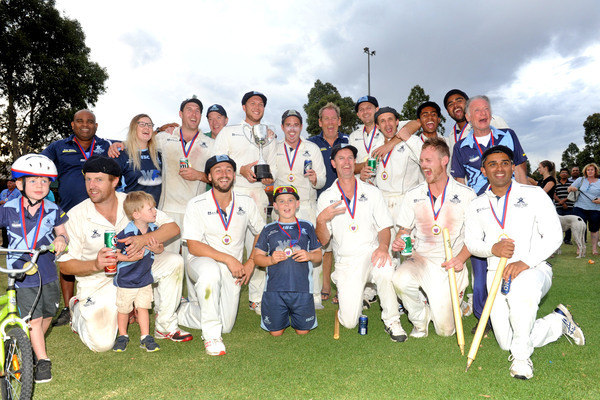 That was it, Buckley Ridges were 2018/19 DDCA Turf 1 premiers. They did have to do it the hard way after losing its first semi-final to Springvale South before crawling over the line a week later in a preliminary final – it takes tremendous mental strength to overcome that and deliver in the big moments. The premiership is the first Turf 1 flag that the club has won since 2012/13, with Suren Ekanayake, Daniel Watson, Paul Rudd, Matthew Goodwright, Ben Watson and Wes Nicholas all picking up their third Turf 1 flags.